Like chicken noodle soup for grown ups. And vegetarians. 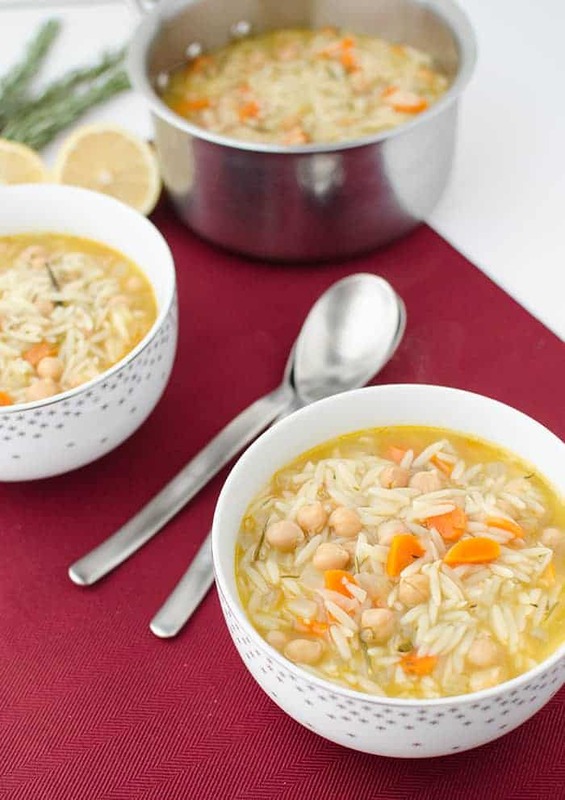 A one-pot soup filled with vegetables, garbanzo beans and orzo pasta. Finished with a generous squirt of lemon juice for a bright + bold fall soup. 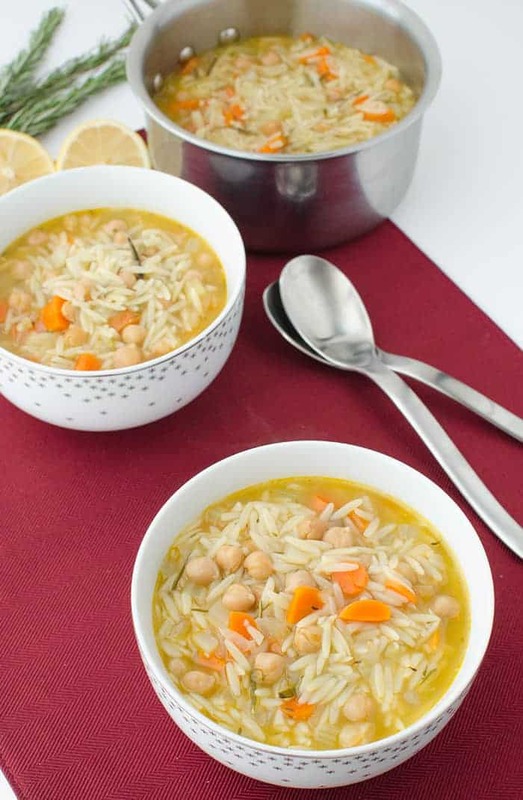 The perfect vegan chickpea orzo soup. October is National Pasta Month! Although, I have been celebrating all year. It’s no secret that I have an extreme love affair with pasta. Pasta in the morning. Pasta in the evening. I have yet to meet a pasta that I didn’t immediately fall in love with. Sometimes, I even read “Everyday Pasta” in bed before falling asleep just to be inspired for dinner the next night. True story < — Please send help. This much love, however, is not without consequence. Mostly in the serving size department. Because, while pasta is certainly not the evil it’s made out to be in certain circles, it can be pretty calorically dense. So, with the exception of my pumpkin fettuccine binges, I try hard to convert pasta into a nutrient dense meal. Add protein, add vegetables, add one serving size of pasta, and you’ve got yourself a hearty yet healthy meal. The other fantastic part about pasta is that most boxes ring in at less than $2. 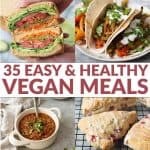 It’s affordable and easy to prepare. Great for busy lifestyles. 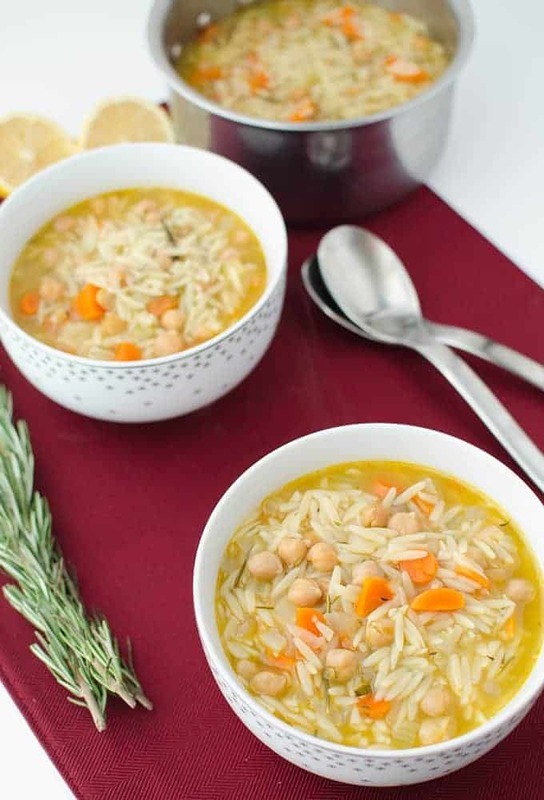 Pasta also pairs perfectly with vegetables and lean proteins, and this lemon chickpea orzo soup is no exception. I love the combination of lightly cooked vegetables, garbanzo beans and orzo! This soup makes a ton (8 servings), and the entire recipe only calls for 1 cup of pasta. That means for each giant bowl, you are getting a serving size of 1/8th cup of pasta. Look at those bowls- does it look like 1/8th cup to you? That’s the power of nutrient dense eating. Every week at the market, I buy a bag full of lemons to brighten up just about every dish. A squeeze of lemon is my secret-ingredient weapon for making food look bright & taste fresh. A few slices in my glass also gets me to drink way more water than I typically would. As expected, lemons also work their magic in this soup. So yes, I have started putting lemon juice in soup now. I would call it weird it if wasn’t so delicious; a squirt at the end is transformative. Like chicken noodle soup for grown ups. And vegetarians. 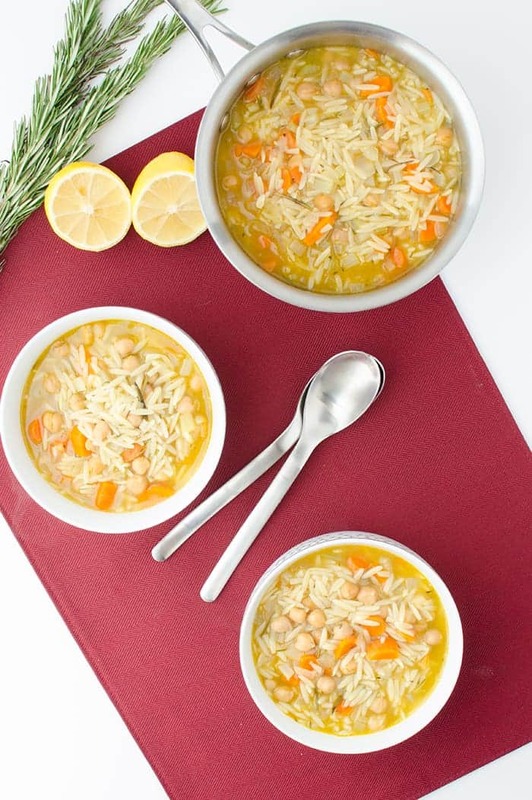 A one-pot soup filled with vegetables, garbanzo beans and orzo pasta. Finished with a generous squirt of lemon juice for a bright + bold fall soup. Add the thyme and pinch of pepper; stir together. Add the chickpeas, rosemary, orzo and bay leaf. 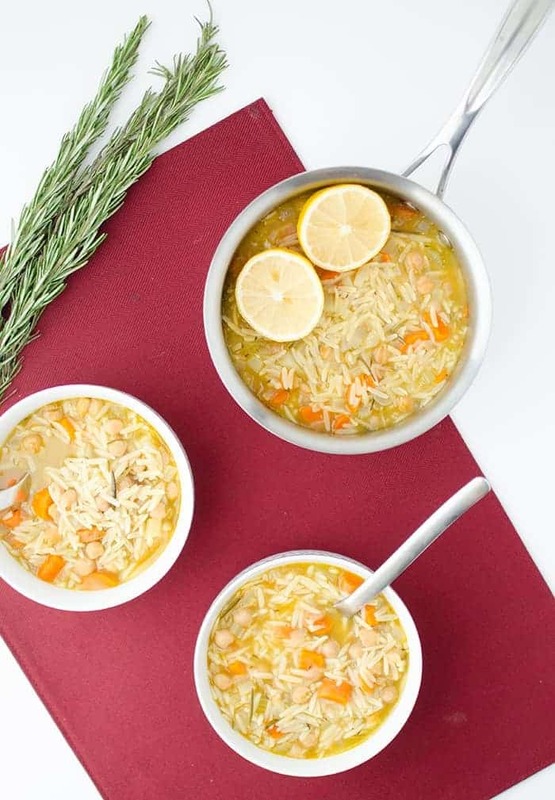 Reduce heat to a low simmer and cook for 10 minutes until orzo is cooked through. Reduce heat to low and stir in lemon juice. This looks really good. I never would have thought to put some lemon juice in a soup. Yum! I love lemons in my soup! 🙂 This looks excellent, one can never go wrong with pasta and chickpeas! ooh that looks good. I wouldn’t have added lemon to soup. Already pinned. You and I would make great lunch companions! Made this tonight as the vegetarian part of our dinner. It was delicious, served with garlic bread. Can’t wait for leftovers. Thanks! Thanks Vivian! Glad you liked it! Up above you state 1 c. orso in soup makes 8 servings but down below the recipe (has 1 c.) says it serves 30 I’m totally confused how many this really serves! Whoops! That was supposed to be 30 minutes 🙂 This soup serves 8! So glad you liked it! Thanks for sharing your version! Love love love this soup! I didn’t have orzo but I had pearled cous cous and I also added a spoonful of homemade chili oil. Perfecto! Can’t wait for my sick husband to try it. This will cure him right up!! Thank you for this recipe. THANK YOU so much for commenting! So glad you loved it! This was so tasty and easy! I was more generous with the lemon juice and pepper and finished it with a bit of sriracha sauce. Definitely will make this again! You had me at sriracha! Is there anything that sauce doesn’t taste good on? So glad you liked it! Thank you! Silly question perhaps, first time soup maker here. When cooking these vegetables for 5 minutes while waiting for them to get soft, is this in a different saucepan? After adding the thyme and a pinch of pepper, do you add the vegetable broth and water to a different pan and then throw in the vegetables? I’m a bit confused. You would start out cooking the veggies in a soup pot and then add the broth and the rest of the ingredients to the same pot. Hope that helps! Yes! Wow, NMS I am SO sorry that I missed your original comment. Thank you Tallya for responding! it’s all in one pot. Hope you liked it! Interesting recipe. Mine came out juicier looking than your photos. I think I’ll add more veggies next time. The flavor was just ok. A tad flat. More spice? I used fresh thyme. There are only two of us here, so I have the leftovers in the fridge. I’m thinking it’s going to make a wonderful leftover! Will definitely make this again, just might change it up a bit. Thanks!!! Adding salt truly brought this recipe to life. Glad you liked it! Thanks for sharing your feedback. This soup is so delicious! I was intrigued by the lemon in it and had to try. Success! My husband loves it too! He usually insists on soup with meat in it but he gobbled up a bowl and got seconds! I’ll definitely be making this again. I was very pleasantly surprised by this soup! So simple and cheap, but very tasty! Orzo is difficult to find where I live, so I substituted ordinary macaroni noodles, but other than that was able to follow the recipe. Never added lemon into a soup before, but you’ve convinced me it really brightens up the dish! Just wanted to thank you for this wonderful vegan soup recipe. We as a family had a get together over the past weekend, and my vegan daughter-in-law used your awesome recipe and prepared this as one of the soup dishes we enjoyed. We had a soup day, due to the inclement weather here at present. We also made a non-vegan soup for the other family members. I will post this on my blog (with our own image) but with full credit to you and link back to your recipe. I hope that this will be acceptable to you. Again, thanks for this wonderful recipe. We will for sure use this again in future. Before publishing it I await your response at your earliest convenience. Thank you again. So glad you liked it! Yes, please feel free to post it with a link back to the full recipe. Could you send a link to the directions on my blog? That way SEO won’t be affected! Thanks! Alex, sorry I do not understand which link you refer to. 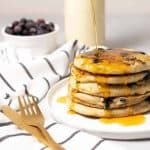 If you prefer, I will just list ½ of the ingredients, and then just link to your post for the rest. Would you rather prefer that? Oops, late on a Friday evening, I got it! Sure I will do that. Just made this! With some slight alterations due to limited ingredients. But SOgood! And the lemon juice gives it that perfect kick! One of my all-time favourites! I know this makes 8 servings – how big would you say a serving size is though? Hi Connie- roughly 1 cup. Thanks! What type of onion? And what size can of chickpeas? I can’t wait to try! Looks delish. Medium onion and a 15 ounce can of chickpeas! Updating the recipe now. Thanks! Thanks for that, I was unsure of the size of can for the chick peas. I am making this tonight! I have always loved the avgolemono soup (Greek. egg, lemon and chicken soup) so I I’m sure this will be great! Yes! I love that one too- hope you enjoy it! This was unique and delicious! I didn’t have any Rosemary, so added more thyme and some oregano. Decided to add more lemon after tasting – ended up doubling. Love the what the lemon adds! Better than Chicken Soup for a winter cold!! Thank you! So glad you liked it! Thanks Julie!